Points Nécessaires : 1650 Veuillez noter que, pour l'instant, vous ne pouvez pas télécharger du contenu à partir de notre plate-forme directement sur un appareil mobile (téléphone, iPod, iPad, tablettes ...). Vous devez télécharger vos articles sur un PC ou un Mac, puis de les transférer sur votre appareil de façon normale. Nous travaillons à autoriser le téléchargement direct aux périphériques mobiles, mais ce n'est pas possible dans la version actuelle de la plate-forme. Désolé pour le dérangement! NOTICE: Activation key must be used on a valid Steam account. Requires internet connection.ABOUT THE GAMEIn the far future, Mankind has nearly exhausted all of earth’s natural resources. Fragile alliances between nations are tested to their limits as fierce wars ignite across land and space. MoonBase Commander puts you in charge of your own lunar territory in a quest to build the most powerful e… mpire in space. Find, exploit and utilize valuable energy pools to eliminate rival factions. Choose the best strategies to accomplish your goals by using weapons, surveillance or shields to fortify your defenses. 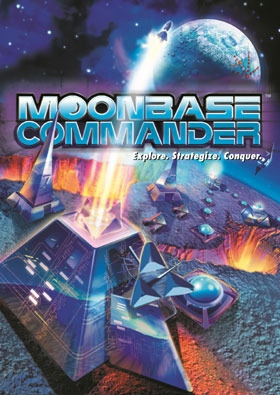 MoonBase Commander is a simple to learn but difficult to master turn-based strategy game. Featuring multiple and unique opposing factions, bright graphics, a tight narrative and a variety of customizable terrains. Battle against the challenging AI or your friends via LAN multiplayer.KEY FEATURES One of the purest and most engrossing classic sci-fi games of all time. Simple rules, endless strategies. A bitter battle for territory with a perfect blend of skill and turn based strategy. Set your own challenge level in a fully customizable skirmish mode. Take on your friends on in the ultimate multiplayer LAN battle. Customize your battlefields with the built-in map editor.Note: Multiplayer available via LAN only. SYSTEM REQUIREMENTS OS: Version: Windows XP (SP3), Windows Vista (SP2), Windows 7, Windows 8, Windows 8.1 Processor: 1.8 GHz Processor Memory: 1GB Graphics: DirectX 9 compatible 3D graphics card DirectX Version: 9.0c Disk Space: 1GB Sound Card: DirectX 9 compatible sound card ©2002-2014 Rebellion. The Rebellion name and logo and the MoonBase Commander name and logo are trademarks of Rebellion and may be registered trademarks in certain countries. All rights Reserved.